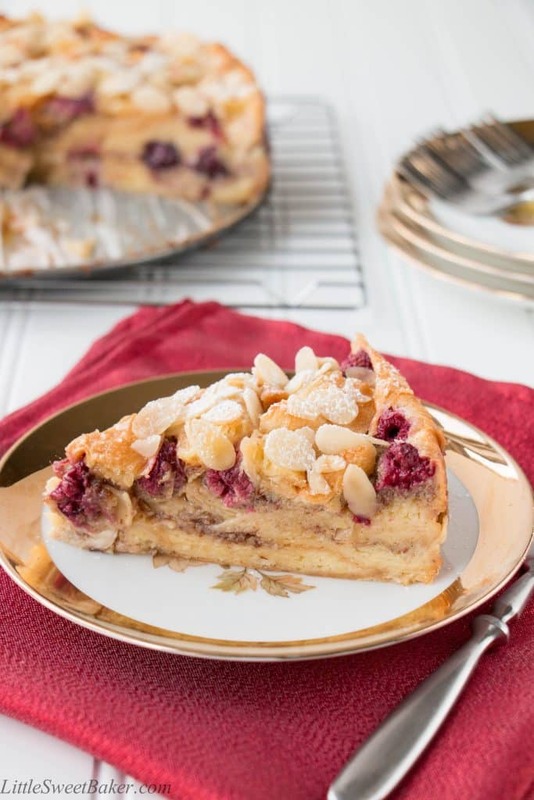 Buttery flaky croissants, ripe juicy berries and crunchy almonds all baked in a luscious custard makes this cake absolutely irresistible. 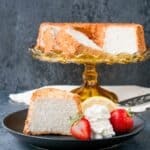 This croissant custard cake has been on my to-do list for a while now, but I was waiting for a special occasion to make this indulgent dessert. 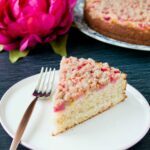 With Mother’s Day around the corner, I thought this would be a perfect dessert to share with mom for brunch or mid-afternoon tea. This cake is similar to bread pudding, but made more luxurious with the use of croissants instead of sliced bread. The croissants add a buttery flaky richness to the cake. The berries add a fresh pop of flavor. The ground and sliced almonds add a lovely aromatic taste and crunchy texture. All this is baked in a soft creamy custard. Be warned that this cake is highly addictive. 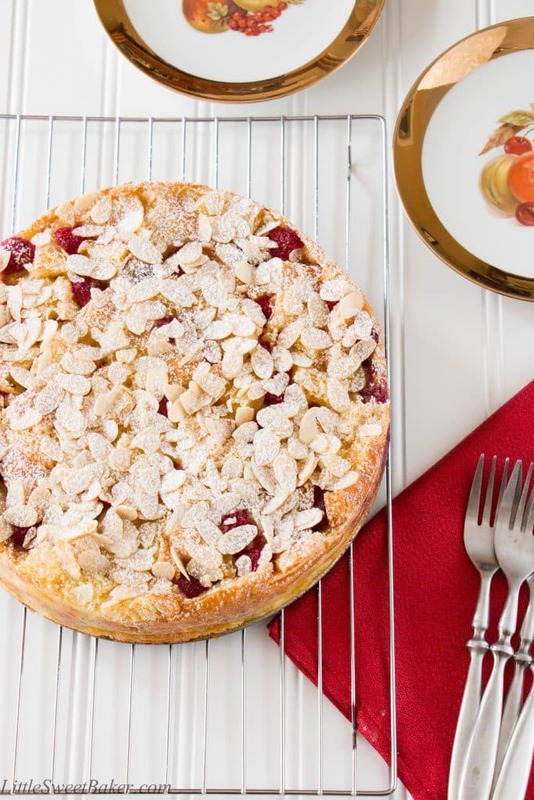 There is just something about this soft and creamy almond berry croissant custard cake that will keep you coming back for more. 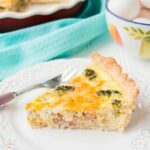 In a large bowl or jug, whisk together the eggs, sugar, milk, cream and almond extract. Set aside. In a small bowl, toss together the ground almonds and cinnamon. Set aside. Grease or line with parchment paper a leak-proof 9″ springform pan. Please make sure your springform pan is watertight. If it is not, place the baking pan on top of a cookie sheet, so the custard mixture doesn’t leak all over your kitchen and oven. Cover the bottom of the baking pan fully with the first layer of croissants. Sprinkle half of the almond mixture and place blackberries on top. Place another layer of croissants. 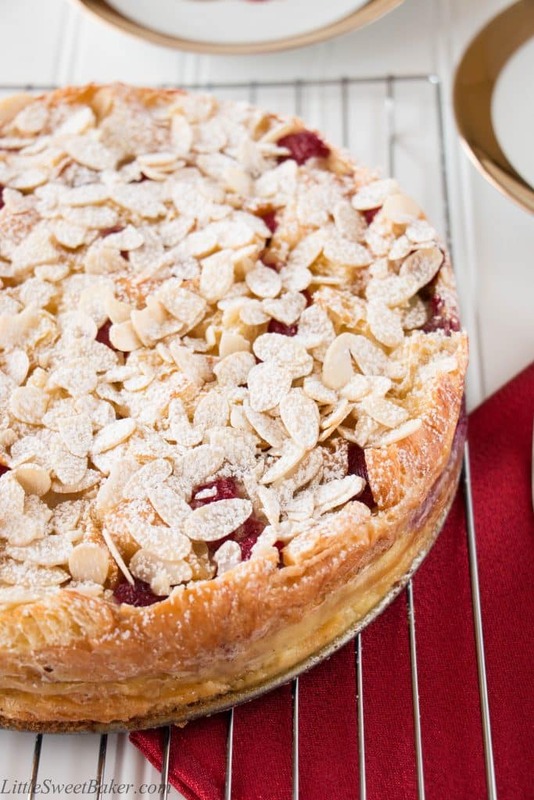 Sprinkle rest of almond mixture and place raspberries on top. Cube the remainder croissant and place on top. Slowly pour the egg mixture over all the croissants to fully coat. Let stand for 1 hour. Preheat oven to 325F and sprinkle with sliced almonds. Bake for 45-60 minutes or until the custard is set and a knife inserted into the center comes out clean. Let cool for 30 minutes before serving. Dust with some powdered sugar if desired. Store leftover cake wrapped up in the refrigerator for up to 3 days. 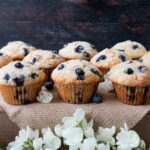 You’re the best ,thank you for sharing your recipes with us. You’re very welcome, and thank you for your kind words! 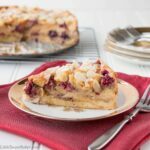 I made this earlier and I love the croissant bread mixed with not only the crunchy almonds but also the soft and sweet berries! Hi Lily! What kind of croissants do you recommend? I personally like real butter croissants. Costco has got some good ones, but any kind of large croissants work. I hope you enjoy it and as always feel free to email me back if you have any other questions, Yulia. Have a great day! This looks absolutely phenomenal!!! Even though I already had dinner ( and dessert) I think could find room for this. 🙂 The pictures are amazing too….Thanks for sharing! Just stumbled on your blog! So many amazing and delicious looking recipes, including this gorgeous croissant cake – YUM! Wow, this cake looks delicious and your pictures are great. Thanks for sharing this at Fiesta Friday #117! Wow, this is one gorgeous cake! Fit for high tea (or anytime, lol, like we actually have tea!!) Thanks for bringing this by Fiesta Friday! omg this is such a good idea, I think I’m in love. Looks so yummy! Definitely trying a croissant cake asap! Thanks so much for sharing Lily! Oh wow, this looks amazing and I love that it’s actually easier than I thought it might be since it is made with croissants rather than being a dough that turns out like croissants. So pretty and tasty-sounding. This cake is just beautiful Lily! I just love your photos and your blog is so pretty. All light and airy. Have a wonderful weekend! This is such a creative way to use croissants Lily! This cake looks delicious, great job!